Hey Everybody! Update V0.5 is out! This build includes even more features, and a total of 11 playable chapters! There is now a discord server! Link Below! 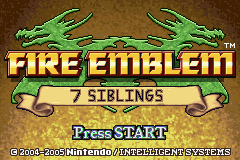 I’ve been a Fire Emblem fan since getting Sacred Stones in a bundle of GBA games I purchased off of Ebay in my younger days. I popped it in, not expecting much, but was immediately hooked, and spent nearly all of that night playing through the game all the way to Ch. 15 or so. Since then, I’ve had the pleasure to play nearly every title in the series. 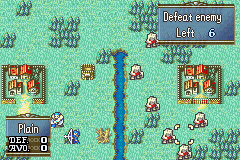 I’ve always found myself drawn back to Fire Emblem; it has engaging gameplay and neat features, but more than anything, it develops characters in a way I’ve rarely ever seen other forms of media do. I’m sure you all understand what it’s like to have a deep, emotional reaction towards a bit of code “dying” on your GBA sceen. 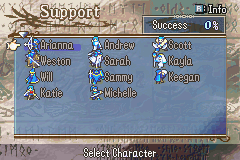 Because of this, despite detours into other games, Fire Emblem has been a staple of mine for years. 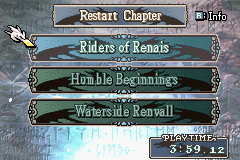 I have toyed around with ROM hacking before, both with Nightmare back in the day and with Pokemon Game Editor, but it wasn’t until I discovered The Last Promise a year or so ago did I discover the scope of what FE hacking could be. 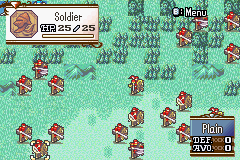 It went beyond altering Roy’s bases so that you didn’t have to haul him around with Marcus, or pallete swapping Hector’s portrait. I saw a fantasy world, created using one of my favorite games. I’ve always loved fantasy and adventure, and have long looked for a medium to express the stories in my mind. The problem was, well, I’m an engineer. I love math and computer science. Art and writing are not my fortes. But, programming a game? That is something I could do. Due to some irl stuff, I couldn’t get started as soon as I would like, but I started planning in earnest a couple months ago. I know the project is likely rough and primitive, but it means a lot to me, and I hope I have made something that you guys can enjoy. I also welcome criticism and any suggestions you may have! I have no idea if I will ever realistically finish this project, but I’d like to continue to work on it. TL;DR I like Fire Emblem. I made a hack. It is my first hack. It is probs p bad. But I enjoyed making it and want to learn. Feel free to post questions, comments, critiques, concerns, and edits! I hope you enjoy! Hey All! I’ve got an updated demo for you! -A new chapter, 5x, featuring a party swap and new characters! 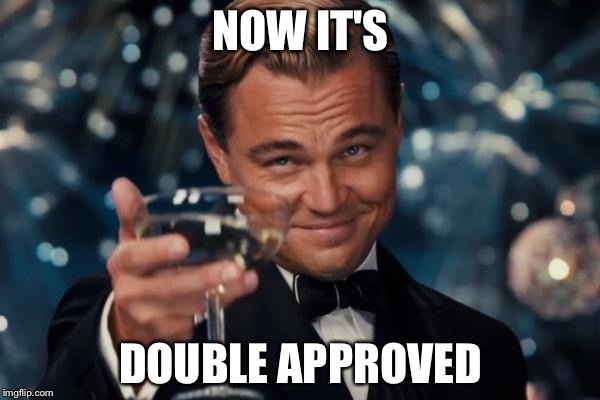 Thanks to those of you who have helped out by critiquing and play testing! This is likely the last chapter I would consider “earlygame”, so another update may not come for a while. (And this hack may move from being just a “concept” to a full-fledged project). Link is below, I hope you enjoy! Nothing wrong with a self insert. yet. You’re already better than me at it. So good job. Even if that’s not saying much. -I had tons of fun making this and learned a lot doing it! Don’t let any negative posts get you down. Everyone starts somewhere. Now to finally get back to work on mine, maybe. Please call End Event directly with Always Cond of ch1. Since this event is set to 0, it does not work. 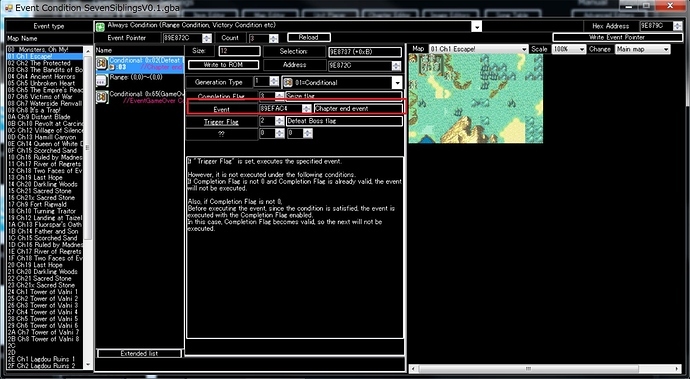 You implemented it correctly in the prologue, but it is 0 for ch1. Your maps look pretty all right based on the screenshots. If you’d like, feel free to DM me for map advice (design or aesthetic) or to clean up a map. Thanks for taking interest in the hack! I’ve updated the OP with a new version, featuring some improvements, bug fixes, and a new chapter! Hope you guys enjoy, thanks to those of you who have played it so far! Sup Homies! I’m here with another update, which includes a new chapter along with several other added features! Hey everybody, here with a new update! Modular minimugs, courtesy of Zane’s patch! New classes and animations, including female thieves, updated druids, and dark knights! The next update will likely include no new chapters, but will rather be a graphical/eventing overhaul of the first few chapters, as I now know more what I’m doing right now. The latest patch is at the top of the OP, hope you guys enjoy! Patch has been changed to include some graphical fixes to earlier chapters, as well as some aesthetic touch-ups to maps and a couple rebalance tweaks, no new chapters or otherwise differences though. Enjoy! Hope you guys enjoy this patch, when I started I couldn’t imagine being at this point! Most updated version can be found at the top of the OP. 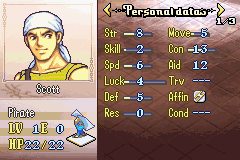 Hype Spoiler for this patch This update features this fella's mug, one of the best to ever grace Elibe. I couldn't not include him. The patch in the OP has been updated, as @A_Reliable_Chair has made some very much needed edits to the Ch. 0 map! It is now aesthetically much better and does not have a river spontaneously start flowing out of an open field. This hack now has an official discord server for discussion and feedback, to better facilitate talking about the hack! The link is both below and in the OP, feel free to pop in and chat! Another minor update to the patch, with some aesthetic map edits, more early chapter graphical fixes, and some larger changes to the Ch. 8 map (it was just quite big and empty and boring, still probably is, but hopefully the changes make it less so). Enjoy!